This blog is not meant to be there for advocacy. 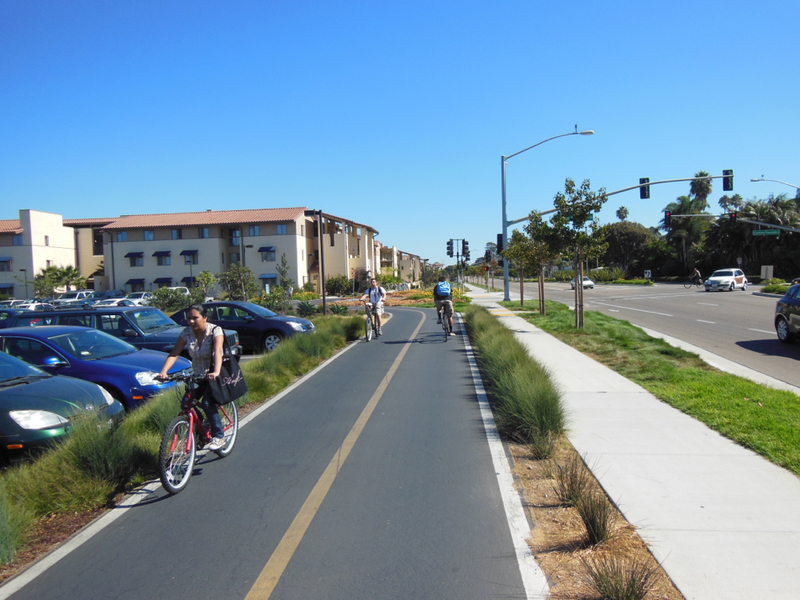 It is meant to provide perspectives for significantly moving cycling traffic growth forward. Once in a while, an article comes forth that may be more on the advocacy side and has content that needs sharing. This is one of these. 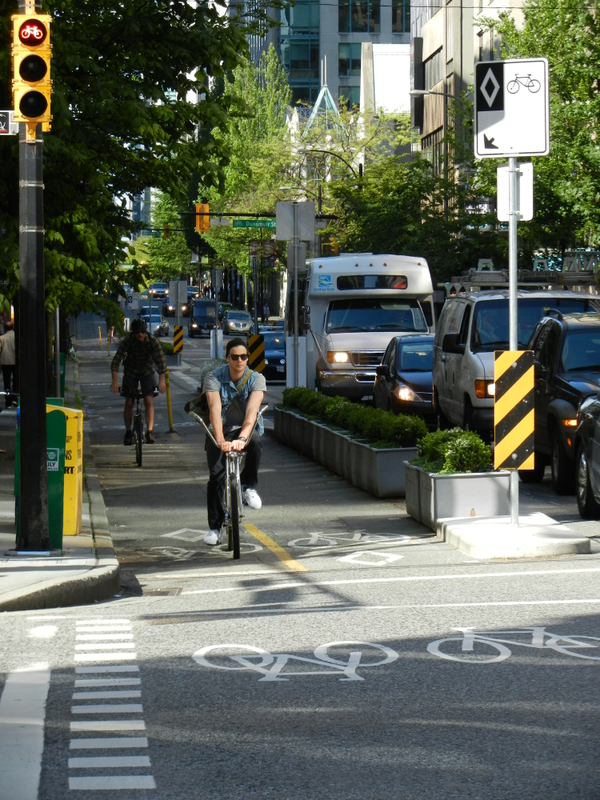 An article was published on 2014-02-07 that needs visibility in North American cities that are struggling to refocus their cities for the future reality of transportation use, and specifically, trying to adjust to cycling infrastructure and separated bike lanes. 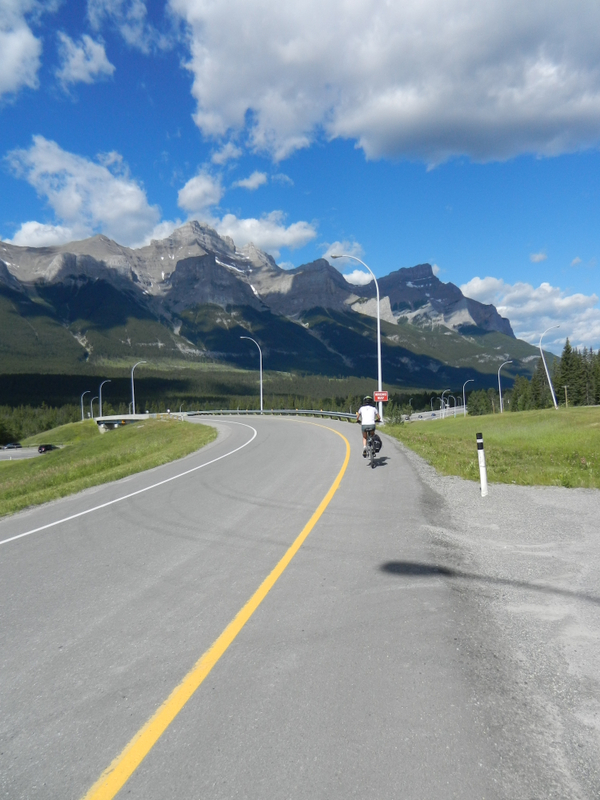 Right now, the media and even one of the local cycling advocacy organizations, Bike Calgary, is abuzz with comments on the Calgary City Centre Cycle Track Network being released and in public consultation this week and next. From all the negativism and positivism being expressed, a business leader comes forth with positive comments on how the cycle track network will be a tool for his job in selling Calgary as a city to do business. Bruce Graham provides an excellent business marketing perspective of why Calgary needs an extensive network of separated cycling facilities within downtown, with connections to the business retailing streets and the very extensive rivers pathway systems. We need to hear more from progressive minded city business people who look forward to the next 30 years and the expectation of another 1,000,000 people living in the Calgary Region. If Calgary were to adopt the 50% workers, 50% residential ratio for downtown Calgary, then about 200,000 of this population growth should go to downtown. With Downtown and the adjacent Beltline, Mission, Inglewood, Eau Claire, Edmonton Trail/Bridgeland retail areas easily accessible by cyclists, local retailers would enjoy the growth that other cities have shown along cycling facilities. As the cordon count indicates, motorists are forsaking driving downtown and switching to transit, cycling, and walking instead. Now, only 32% drive into downtown. 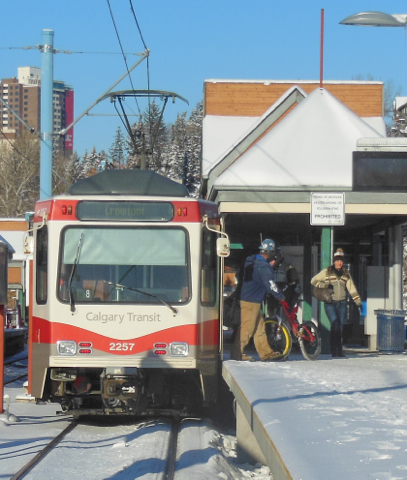 Now, next year, the C-Train will be adding 33% capacity as its trains go to 4 cars. 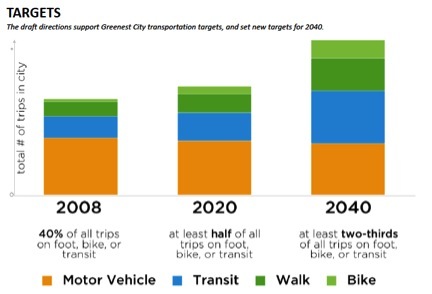 How many more drivers will be making the switch to transit or to combining transit with cycling on their commute? 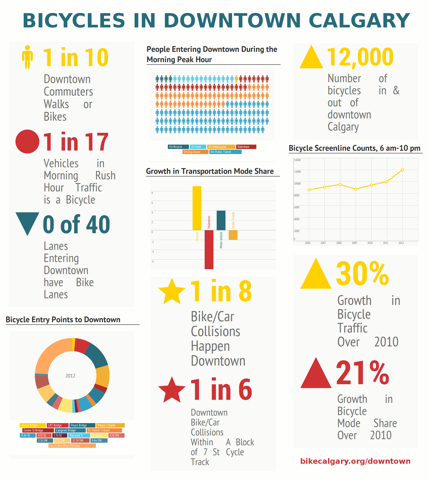 With each new cyclists commuting to work or coming downtown for shopping, one less car will be on downtown streets. 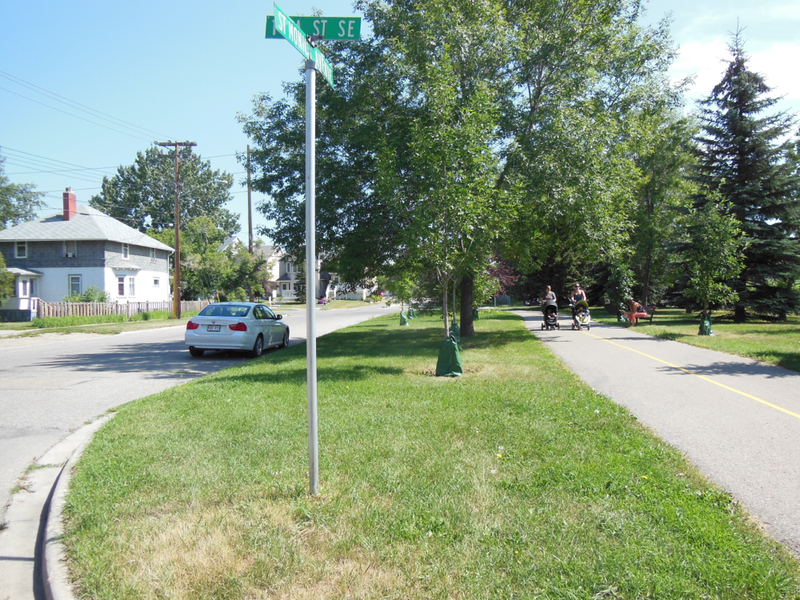 More street pavement will become available for reassignment for separated cycling facilities and sidewalks. As Bruce points out, the business environment downtown will benefit with increased retail sales, lower operating costs, more productive employees, less workforce loss to sickness (both physical and stress). What more, he and is organization will have another strong marketing tool to sell Calgary to business to locate here. Bruce, thank you for the article. It will benefit Calgary and other cities that have the same resistance to move towards a more organic, more liveable, progressive people place city and city core. 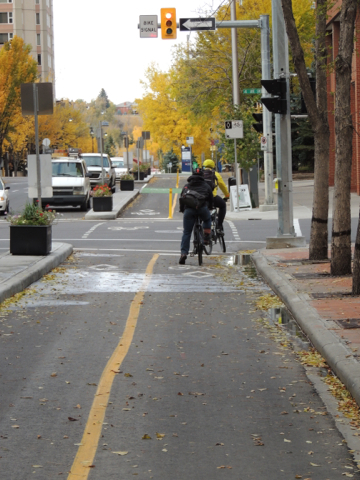 Calgary’s proposed cycle track network has been creating quite a buzz around town lately and we wanted to weigh in on this issue. You may wonder why we, as Calgary’s leading economic development organization, care about a cycle track network for Calgary. Well, as the promotional agency tasked with attracting and retaining the best talent, as well as promoting our business and lifestyle advantages around the world, a cycle track network will help us do just that. It may be less obvious than an increase in healthy lifestyle or taking tailpipes off the roads, but an inner city cycle track network can boost business. In Colorado, cycling brought more than $1 billion to the state’s local economy, and in New York, after the installation of a protected bike lane, retail sales increased by as much as 49 per cent compared to a three per cent increase in sales citywide during the same period. 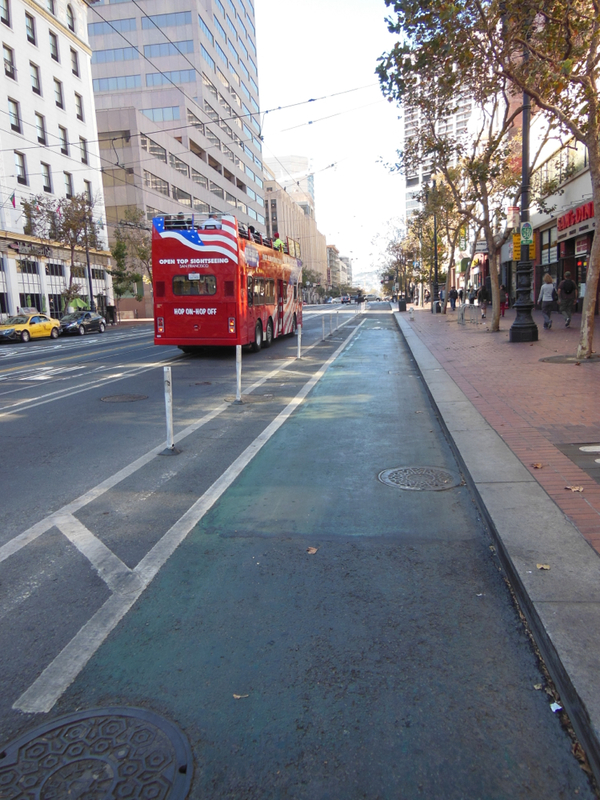 When San Francisco optimized Valencia Street for cyclists and pedestrians, nearly 40 per cent of merchants reported increased sales and 60 per cent reported more area residents shopping locally due to reduced travel time and convenience. Travelling by bike encourages more frequent stops than travelling by car; a study of Toronto merchants revealed that patrons arriving by foot and bicycle visited the most often and spent the most money per month. 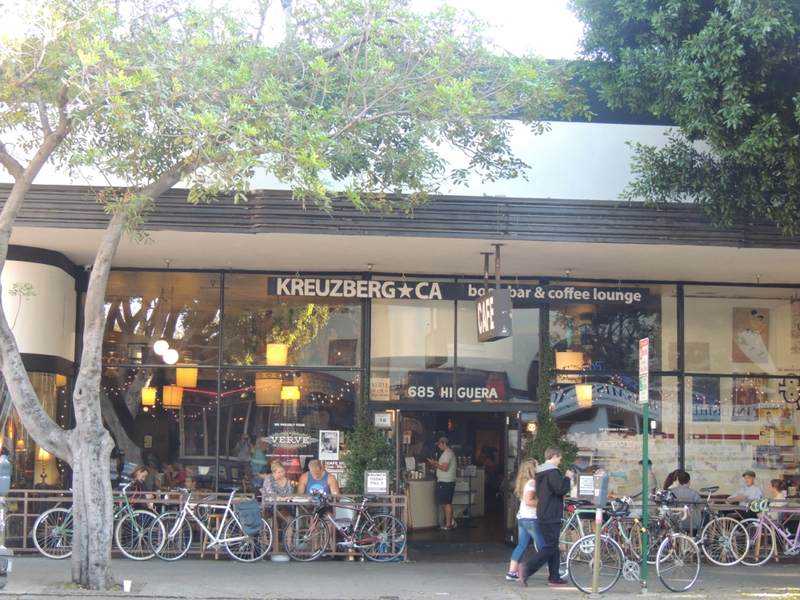 It goes without saying that parking the car and jumping on your Trek is good for your health, but it’s also good for the health of the community. Business owners would be interested in a study done by the Netherlands Organisation for Applied Scientific Research, which found that cycling reduced employee absenteeism — specifically, the employees who cycled to work regularly missed less work, on average more than one day per year less than colleagues who didn’t. And a Minnesota company that encouraged its employees to bike to work saved $170,000 in health care over three years and $301,000 through increased employee productivity every year. And then there’s the social reputation factor: The “I didn’t know the city built on energy invested in commuter bike lanes.” And make no mistake, it is an investment. This is a prime example of the kind of selling feature we use when telling Calgary’s story around the world. People want to live in a city that invests in making the lives of its citizens better. 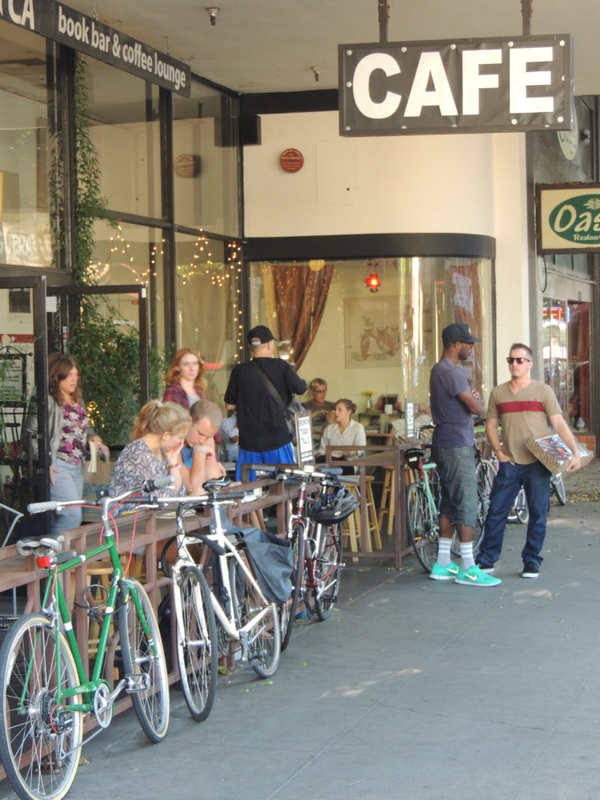 Sixty-two per cent of recent transplants to Portland, Ore., said that the city’s bike friendliness was a factor in their decision to move there. By 2018, Calgary’s population is expected to grow by more than 150,000 people. We’d love to add the cycle track network to our people-attraction tool kit before we see tens of thousands of new cars added to our morning commute. 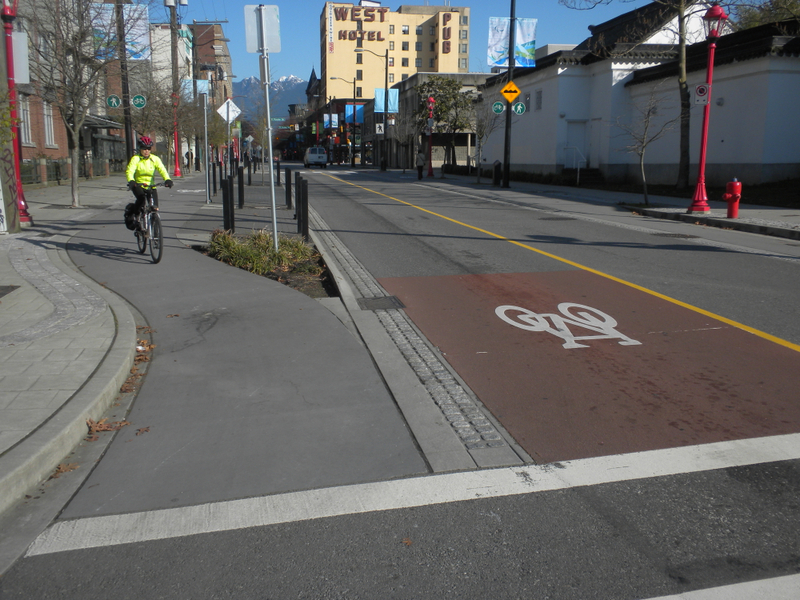 The major benefit of dedicated bike lanes is they help pedestrians, motorists, transit users and cyclists coexist safely. 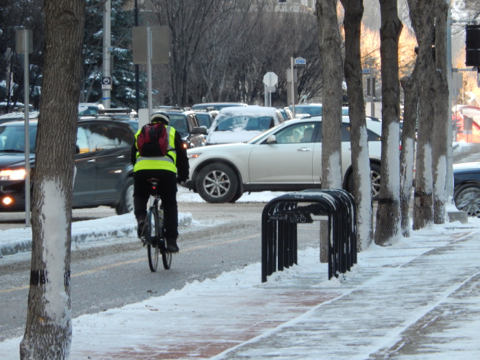 Even in Calgary’s harshest weather, you’ll see many diehard cyclists making their way to work, and these numbers would increase if we made their commute safer. After New York City installed their first protected bike lane (the first in the U.S.), they saw a reduction in injuries to all street users by 58 per cent. Calgary drivers will be the first to say that the unpredictability of cyclists sharing the narrow downtown roadways makes them nervous for the safety of the cyclists and themselves. 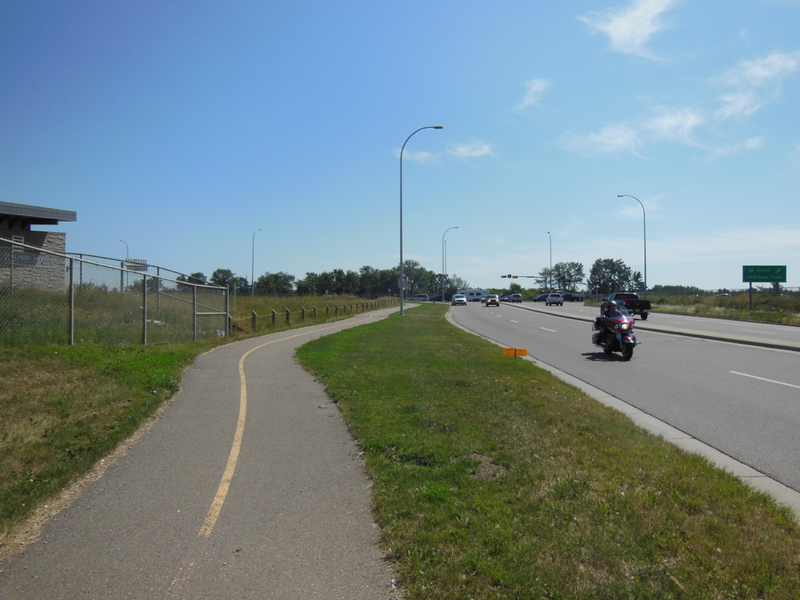 A cycle track network in Calgary gives commuters a reliable alternative to driving, while ensuring the well-being of both cyclists and motorists. 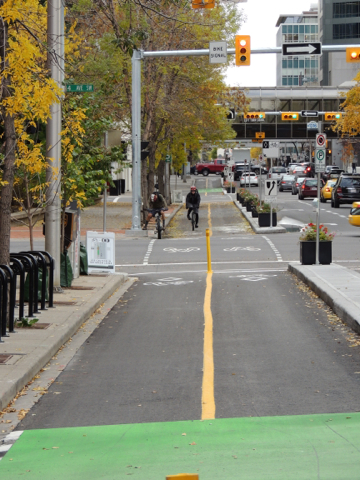 Calgary is already well suited to adopting a cycle track network and here’s why. With the most expensive parking in Canada, our citizens have already shown us they would happily utilize this healthy and fun mode of transportation. The first leg of the cycle track network runs on 7th Street S.W., and over the course of a year (2012-2013), the number of bikes quadrupled per day. Pedestrians were happier too, as the number of cyclists riding on the sidewalk went down by 25 per cent. 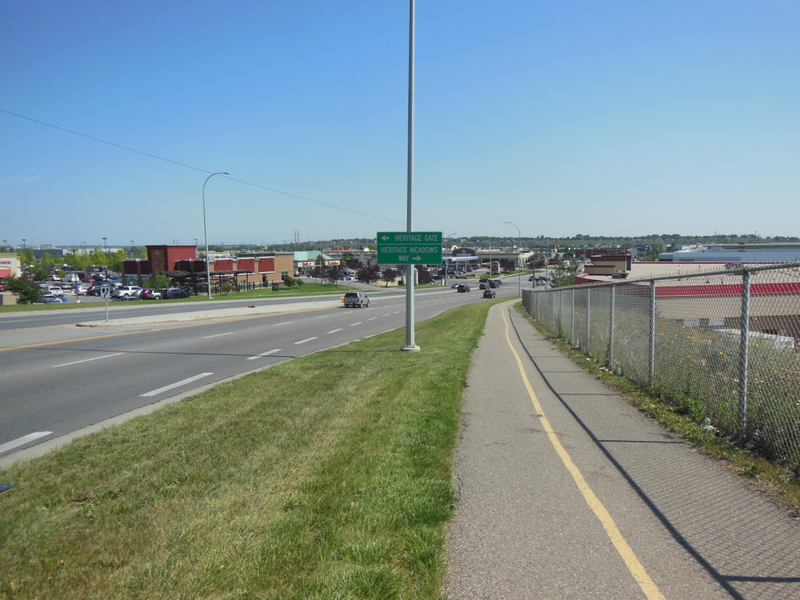 At 700 kilometres, Calgary has the longest paved urban pathway system on the continent. With the addition of a downtown cycle track (and Calgary Transit’s recent announcement that all new buses will have bike racks), commuters can safely and efficiently travel from their homes in any quadrant of the city into the core. Calgarians may be surprised (and hopefully delighted) to learn that over the past five years, a multitude of downtown building owners have added up to 2,000 bike parking stalls in their buildings, telling their tenants and their employees they support their desire to embrace diverse transportation options. We realize adoption will take time and people want to be involved in the process to understand where the proposed network will go and how it impacts them. We encourage Calgarians looking for more information on the cycle track network, to stop by the CORE Shopping Centre, Plus-15 level, by Holt Renfrew, this Monday to Friday from 11:30 a.m. to 1:30 p.m. to talk to the cycle track network team. Bruce Graham is president and CEO of Calgary Economic Development. It is interesting to observe the dialogue from city politicians, staff, the public (both motorists and cyclists), and from the media when there is any movement to propose installation of separated bike lanes. Motorists tend to express their desire towards where the status quo is the best policy. After all, they pay directly for the investment in roadways and their maintenance, not the pedestrians nor the cyclists. The fact that these motorists may live in other suburban communities and drive to work on the candidate streets for separated bike lanes do not distract them from coming forth with strong objections. Desire for having a vibrant, liveable, sustainable and green city where air pollution from cars is reduced seems to leave their thinking process and emotions takes over. More on this later. 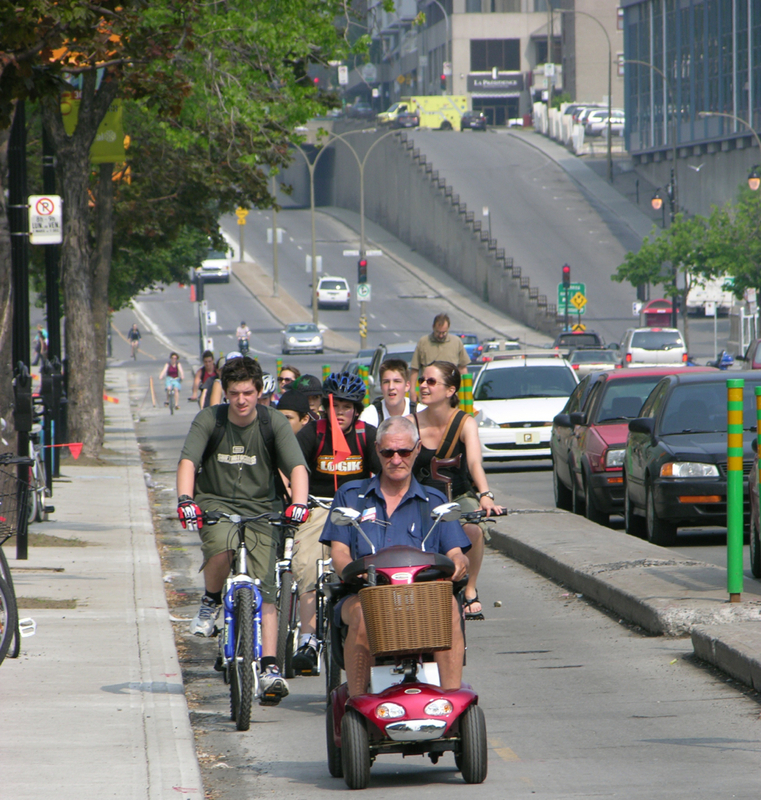 Now, cyclists are not a homogenous group and come out quite vocal, as well as motorists, for their favourite solutions. In the dialogue, the best solutions for growing cycling traffic seem to leave their thinking process, as well. Considerations do not seem to come into the debate for what it will take in infrastructure designs to persuade motorists that they should leave their cars at home and cycle instead. Considerations do not come into their dialogue for what will it take in cycling infrastructure designs to persuade parents with children of ages of preschool, primary school, or young teenagers to let these children cycle with or without their parents, as is the case. To frequently, the media seems to be too interested in firing up some debate to sell papers, airtime, or ad space. So, if they sense that a controversy can be started, they are too willing to go for it. © H-JEH (Jack) Becker, Third Wave Cycling Group Inc. 2007-2012, Velo.Urbanism, cycling planning, policy, and social marketing consultant, 20 year advocate for balanced transportation modes within cities focusing on cycling and transit. The comments in this article come from a touring and commuter cyclist where the bicycle and combined mobility with cycling are the first choices of transportation. 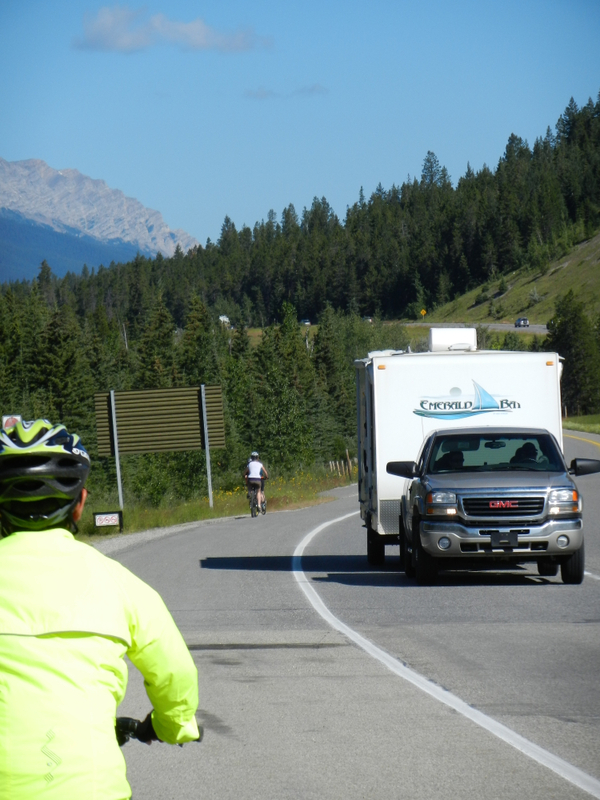 The comments reflect the experience and observations gained while cyclotouring where now the 100,000 kilometres mark is being approached on trips 4 days and longer up to 11 months. 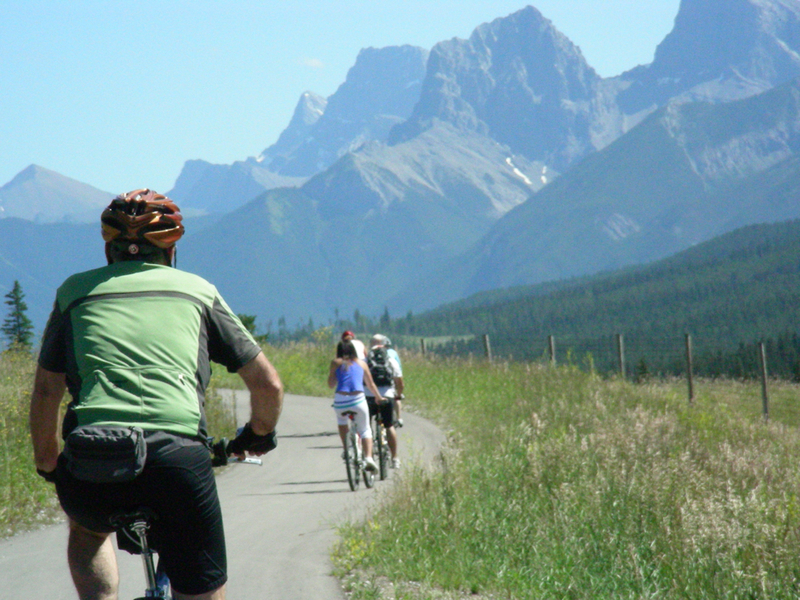 In addition, many thousands of kilometres have been cycled on weekend exploring trips and on day tripping. These trips may be done solely by cycling or combined with other modes of travel including air, trains, buses, ferries, and on some occasions, including cars. 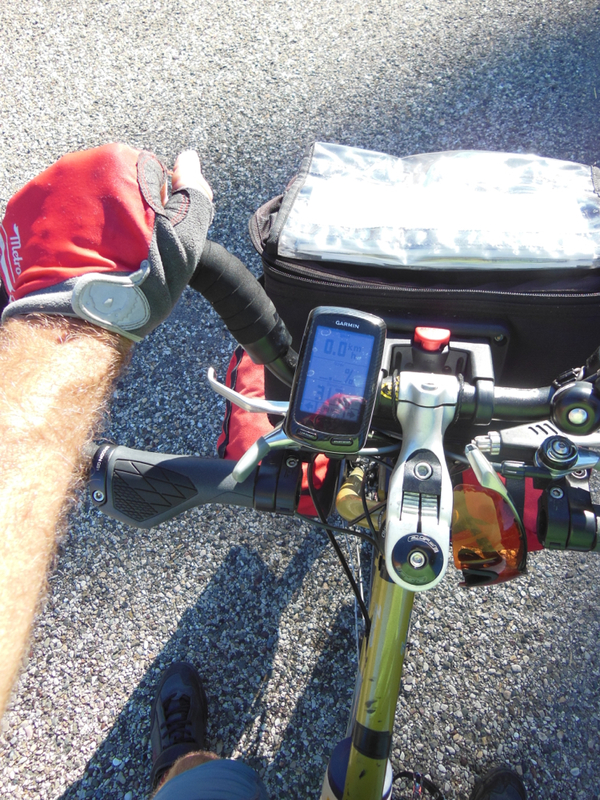 As this blog is being posted, the writer is on a two and a half month cyclotouring trip. A couple of days ago, a 2,025 metres high mountain pass was traversed, a personal high, followed by a modest 1,225 metres pass today with a 1,400 metres pass coming up in two days. This year, the 21-year-old Miyata 1000 touring bicycle was retired for one with disk brakes for cycling through mountain ranges, a Salsa Fargo 2 bicycle. A Dahon touring folding bicycle is usually used when planes, trains, buses, and ferries or European hotel elevators are involved on trips. As mentioned in an earlier blog, this bike path is excellent in drawing people to come and cycle in the wilderness. 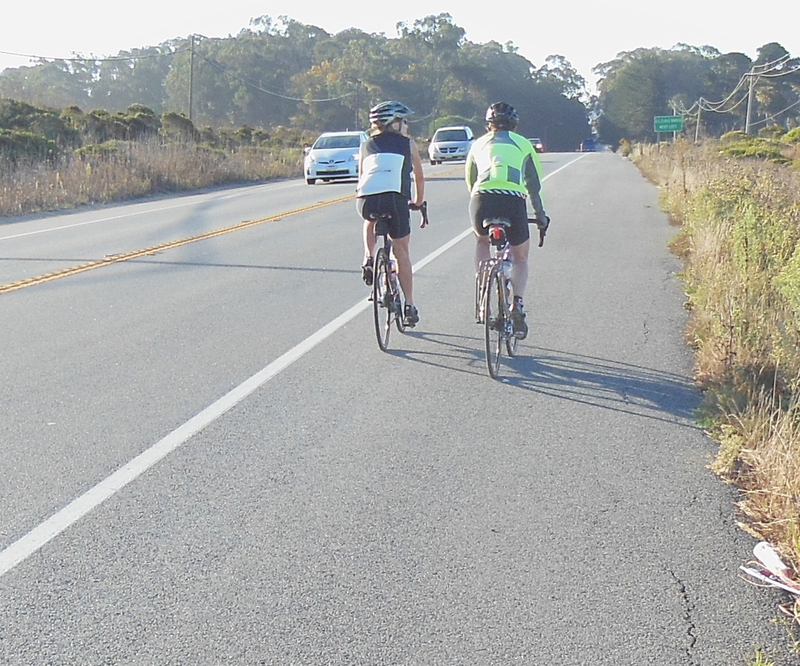 The path alignment and design is attracting cyclists who used to cycle on the paved shoulders of the highway. 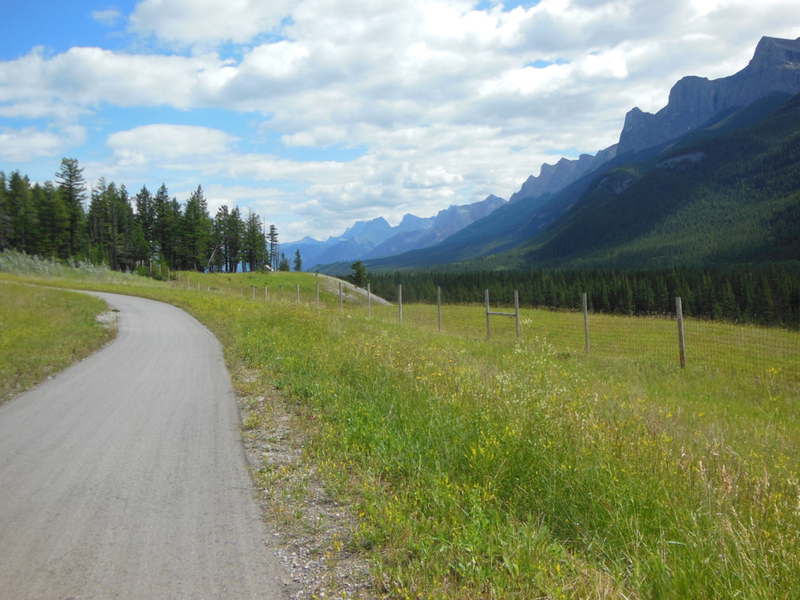 The path also draws tourist staying at Canmore or Banff to rent bicycles and use the trail. 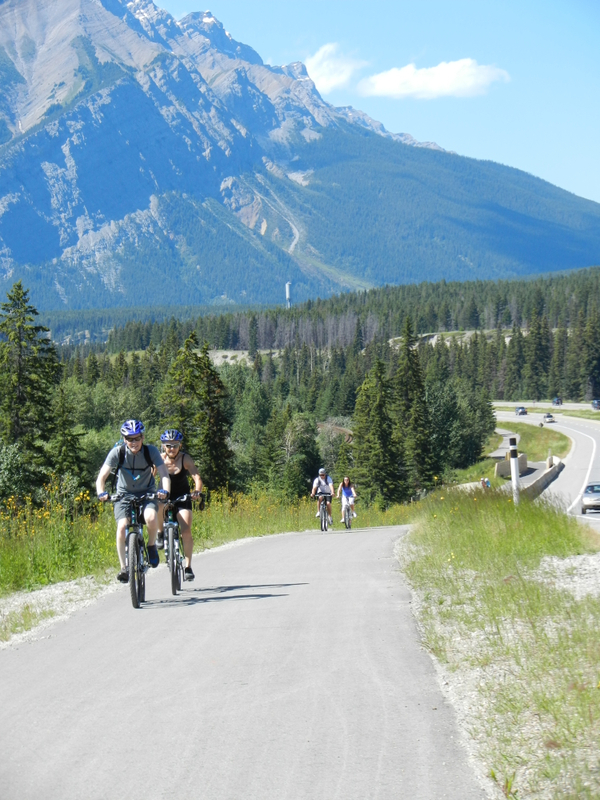 The path also draws families from Southern Alberta to spend a day cycling here. Even good bicycle paths can attract comments and suggestions for improvements and so here are mine. Banff trailhead at the town bus loop. On trips, cyclists want to know where they are, where they should go next, and how afar they need to go. To break the routine of long trips, information on highlights along the route and on the lands being traversed is always welcome. 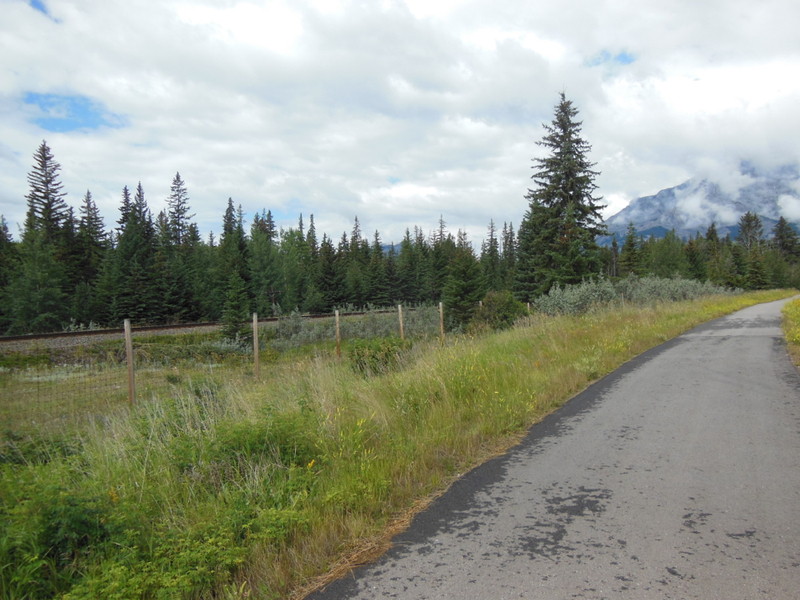 On approaching Canmore either from Trans-Canada Highway #1 or from my preferred approach on Highway #1 A, finding the Banff Legacy Trail is not very evident. 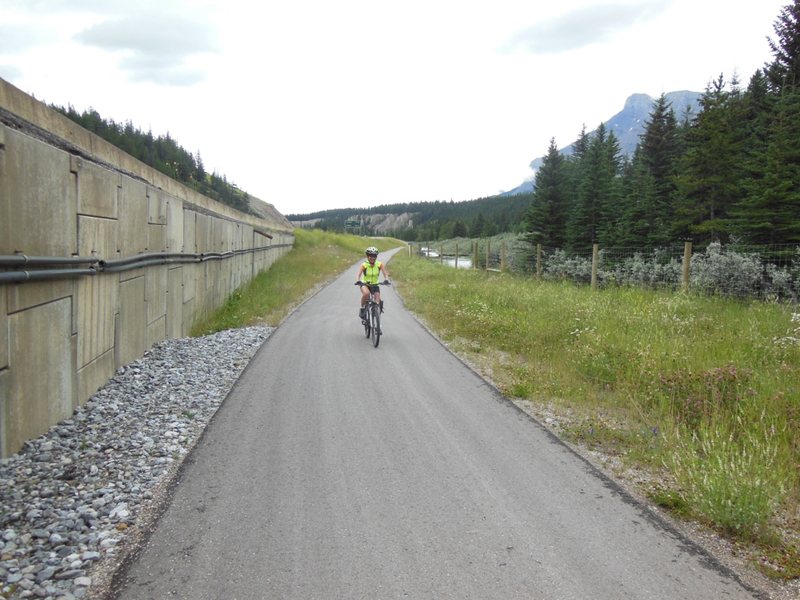 Canmore has two off-road bike routes of which neither is identified on the approaching highways. 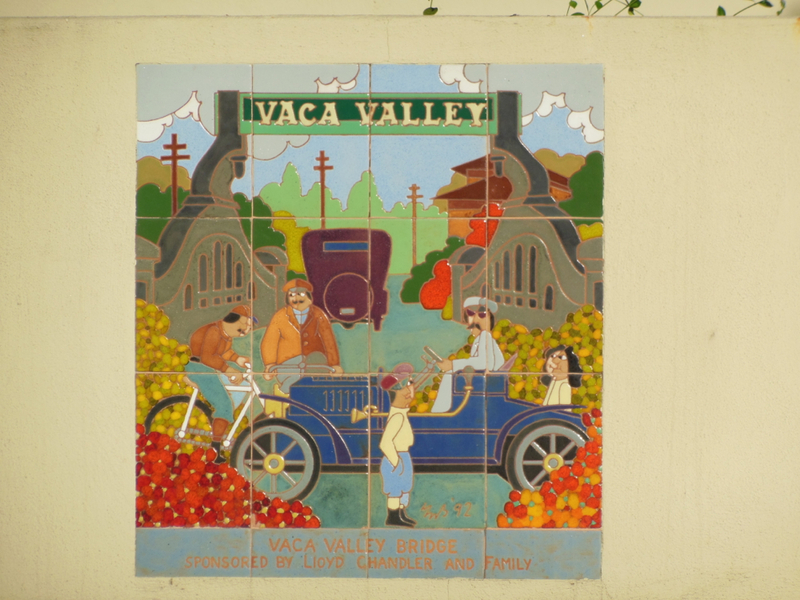 On these routes, there are no signs to connect to the Legacy Trail. There are no maps signs to provide direction. There is no signage such as those that we are used to in Europe. There is no cycling by numbers or knooppuntroutes (node points) to lead you to the trail. 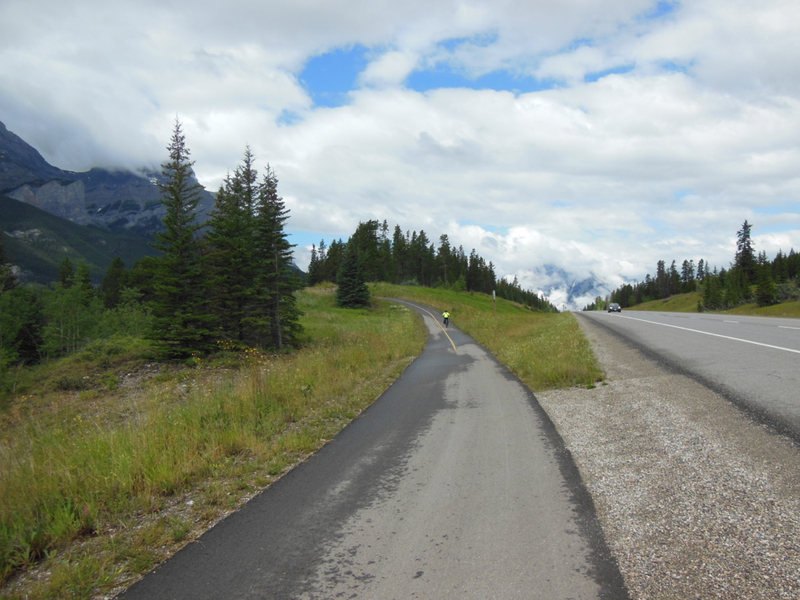 So, finding the Canmore bike routes is a matter of searching or good judgment. 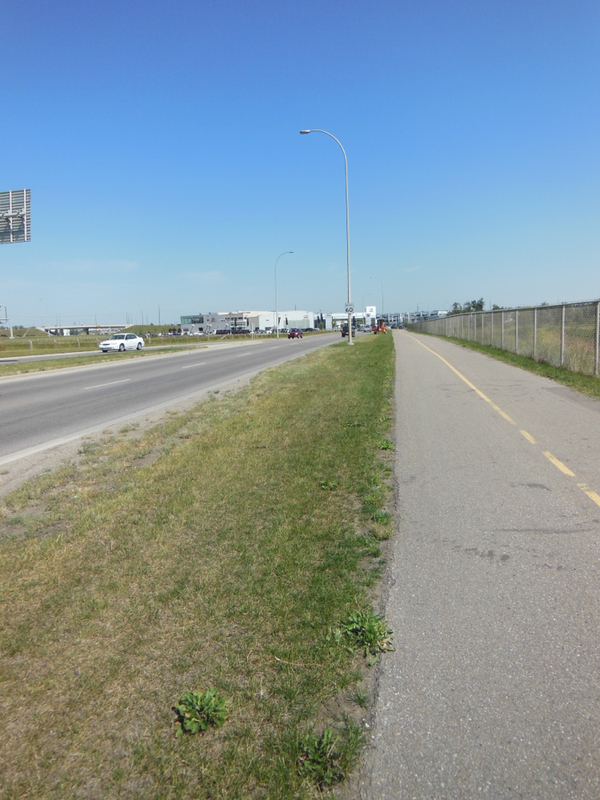 One bike path parallels the highway while the bike trail is adjacent to the railway track in town. How to find them? Canmore can do much to improve wayfinding. 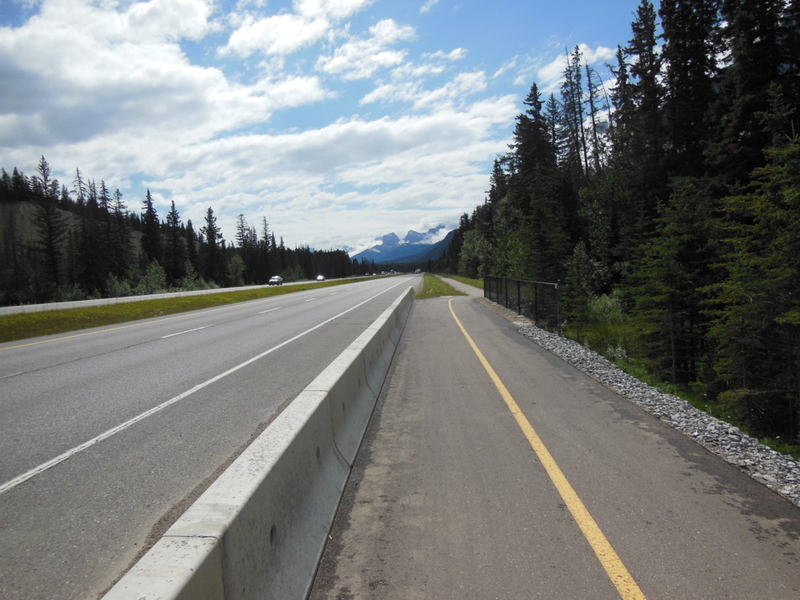 Southbound off ramp from the Trans-Canda Highway with provision for contra-flow cycling to the Banff Legacy Trail. No signage or map advising cyclists to use ramp to connect to trail. 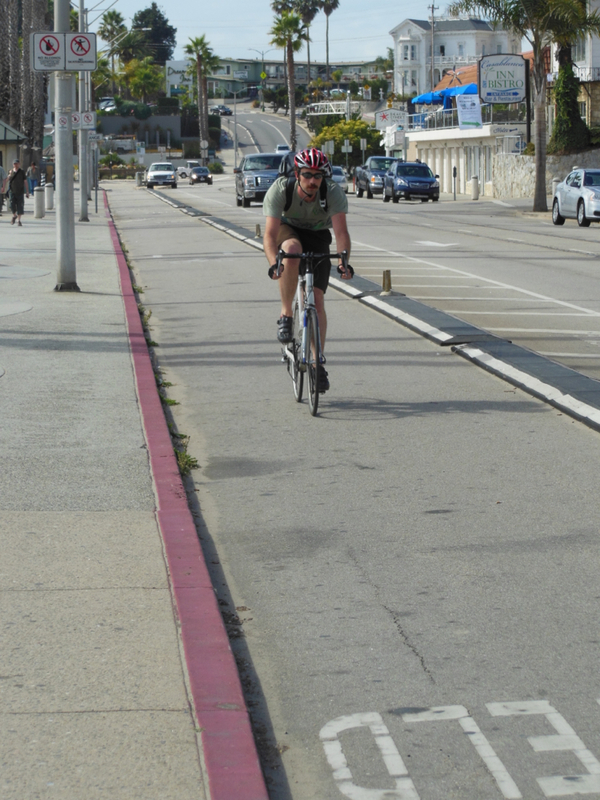 Which side to ramp to use – Stay left of yellow line? 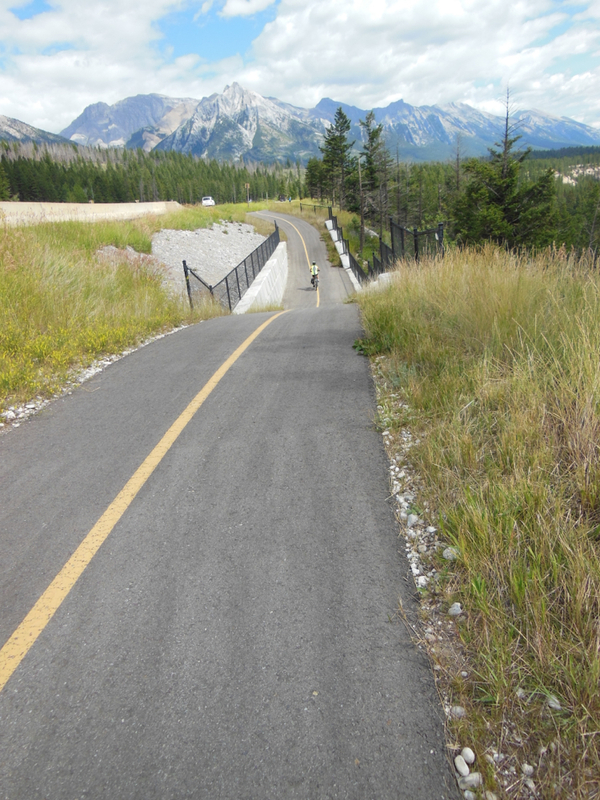 Southbound off ramp from the Trans-Canda Highway with provision for contra-flow cycling to the Banff Legacy Trail. No signage or map advising cyclists to use ramp to connect to trail. 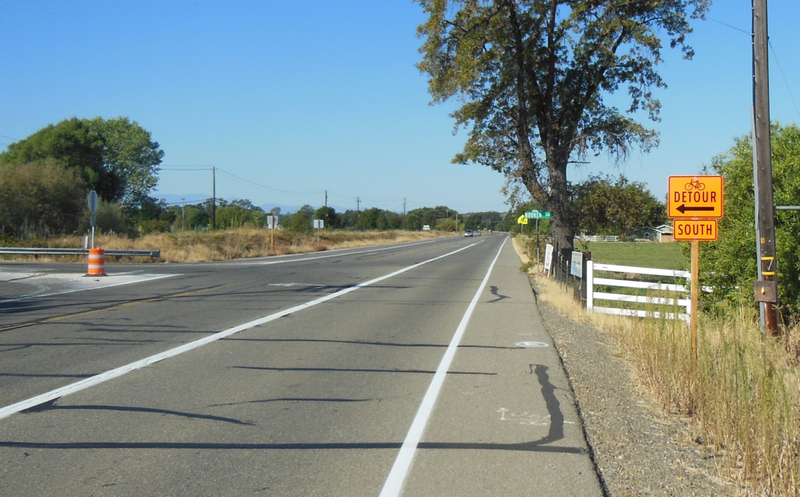 Which side to ramp to use – Stay left of white edge line? 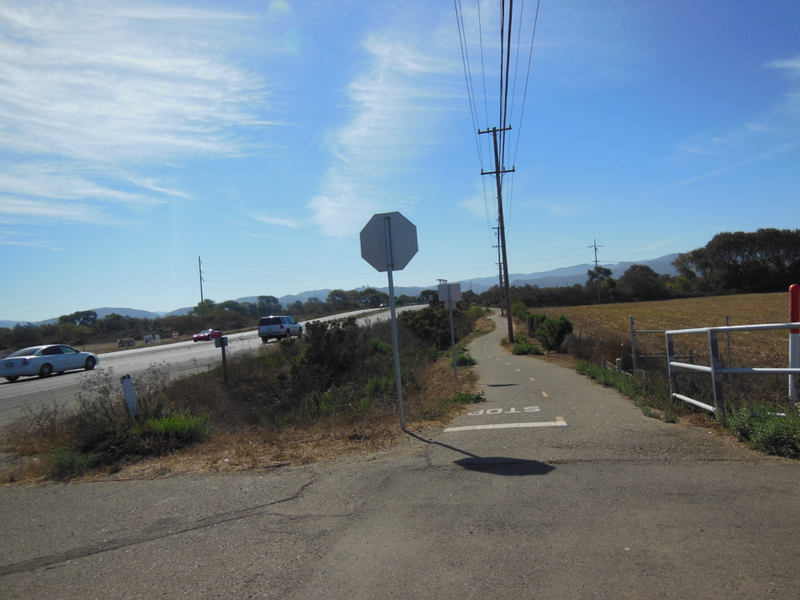 Coming to the northern end of a bike path along the Harvey Heights and Highway #1 roads, you are left with choice and no help. 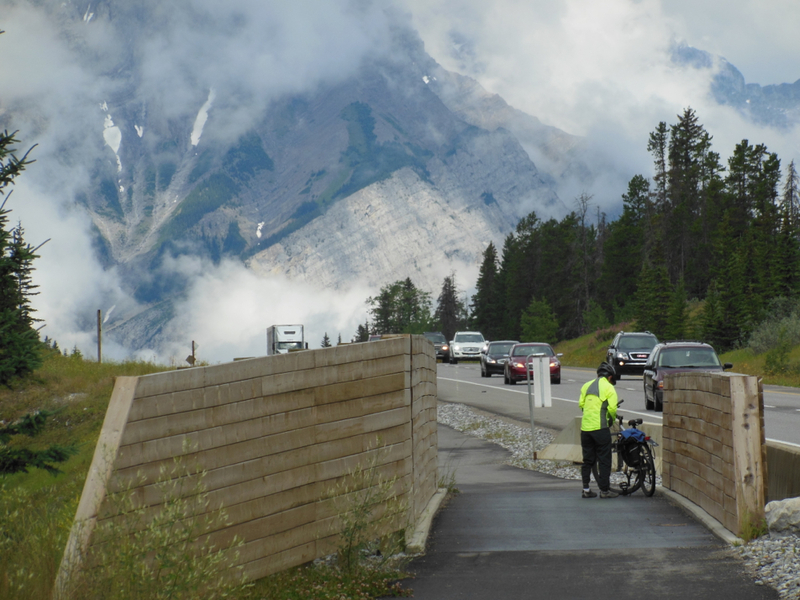 There are no maps to direct you to the Banff Legacy Trail. There are no signs. So, proceed onto Highway #1 northbound, proceed to the park gates, and then cross over the many traffic lanes to reach the trail? 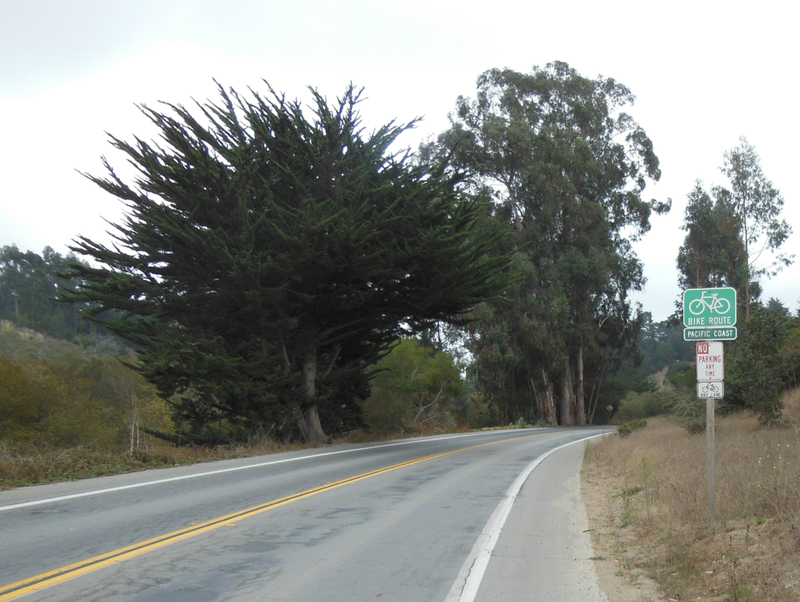 So instead, cycle contra-flow on the southbound off-ramp leading to the Harvey Heights Road. Who would do that? Well, the people who have found direction in other places and are aware that this is the way to go. The ramp has a white line on the right side and a yellow line on the other side. So, which side to take? Which side should one cycle in the contra-flow direction? Then as the ramp approaches the highway, there are no signs indicating that there is two-way cycling on the shoulder for either the cyclists or the motorists. 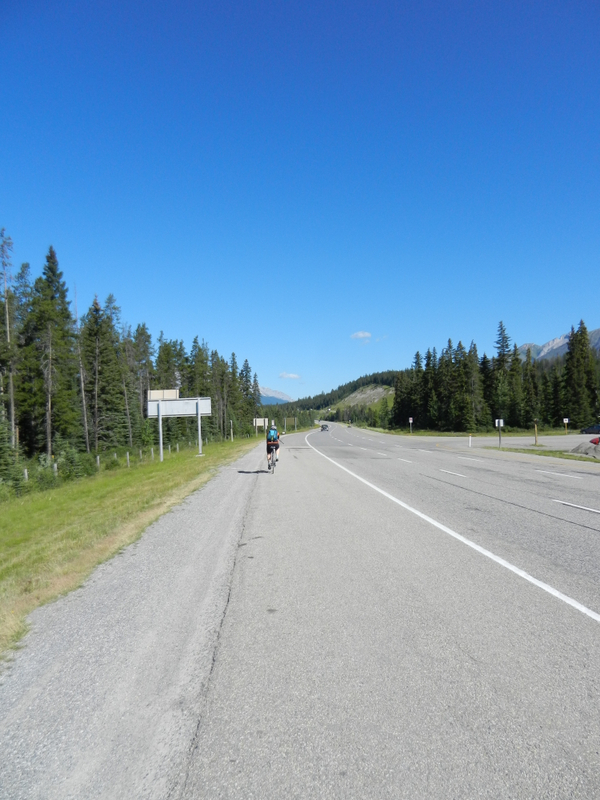 Contra-flow cycling on the southbound Trans-Canada Highway lanes connecting to the Banff Legacy Trail. No awareness signage advising cyclists and motorists of the contra-flow cycling. Then there is the entrance to the Legacy Trail. Where is the signage to indicate to cyclists to descend down the small drop to the left and then turn right onto the trail? There is a fantastic opportunity to simplify finding the trail and make infrequent and other cyclists more comfortable and secure on finding their way. A few kilometres from Banff there is a cutoff to Lake Minnewanka. 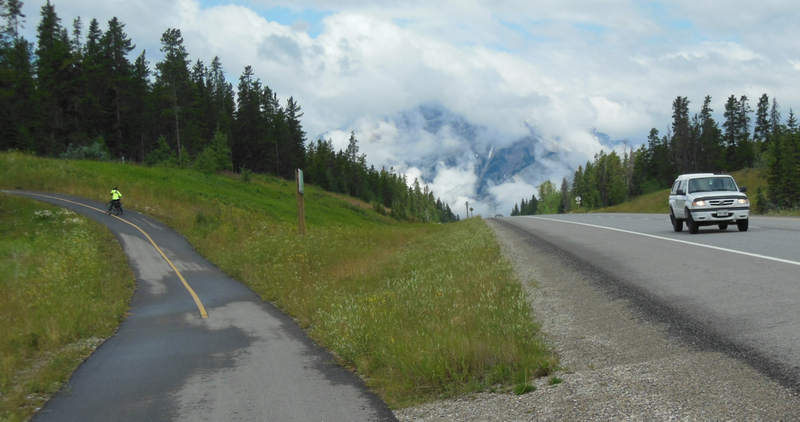 Wayfinding would be very beneficial at this junction for highlighting cycling options the roads to Lake Minnewanka and Two Jacks Lake provide. For information and for generating more cycling interest and traffic, wayfinding signage would be a good addition to the trail. 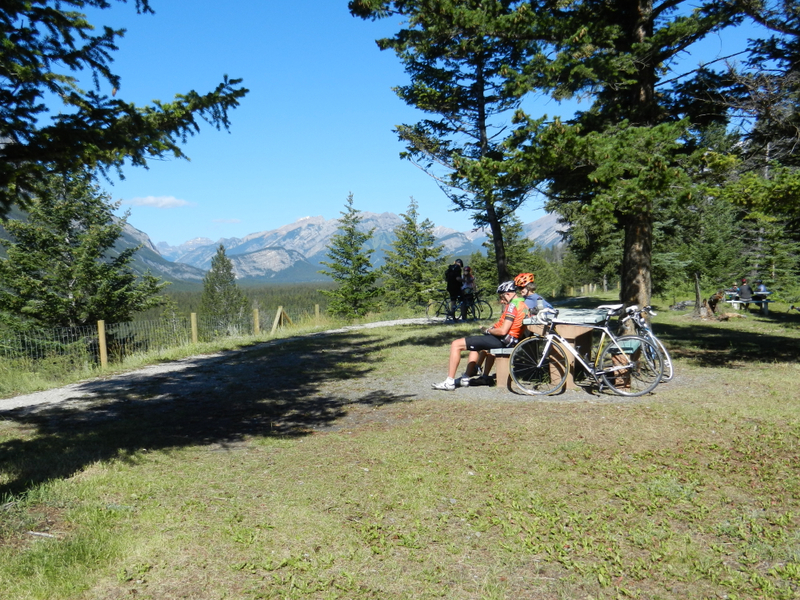 The Lake Minnewanka area provides plenty of choice for cyclists from just cycling the road to wandering down one of the trails, to taking a tourist boat on the long lake, to camping on one of the many sites, to enjoy watching wildlife grazing on the roadside or walking on the trails. 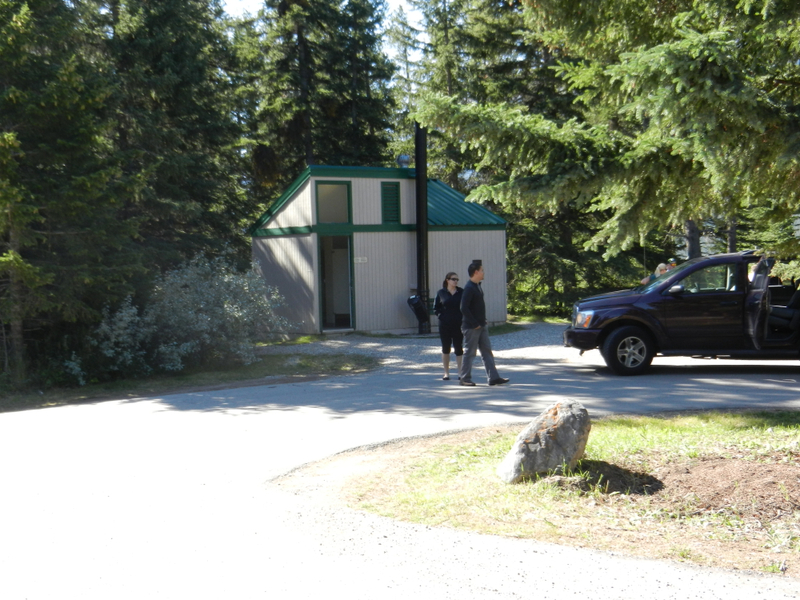 Arriving at Banff, the trail map indicates a route through the town and then connecting to the Bow Valley Parkway. 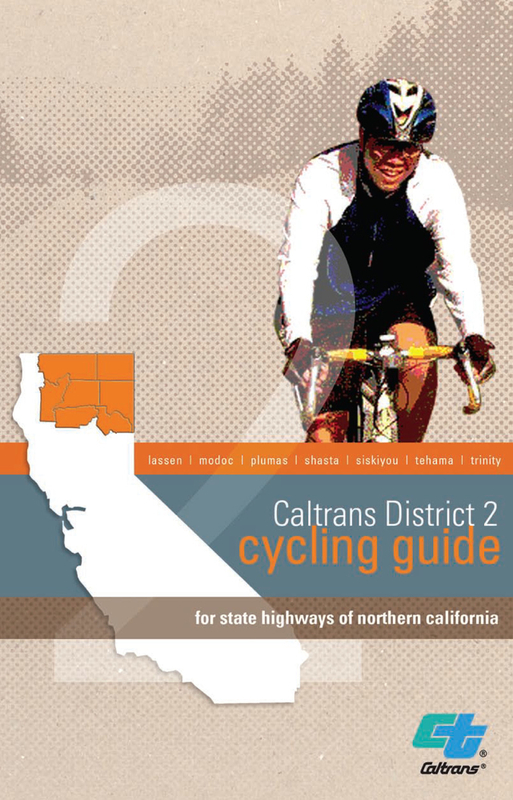 None of this is evident at the trailhead or on the roads identified on the map. 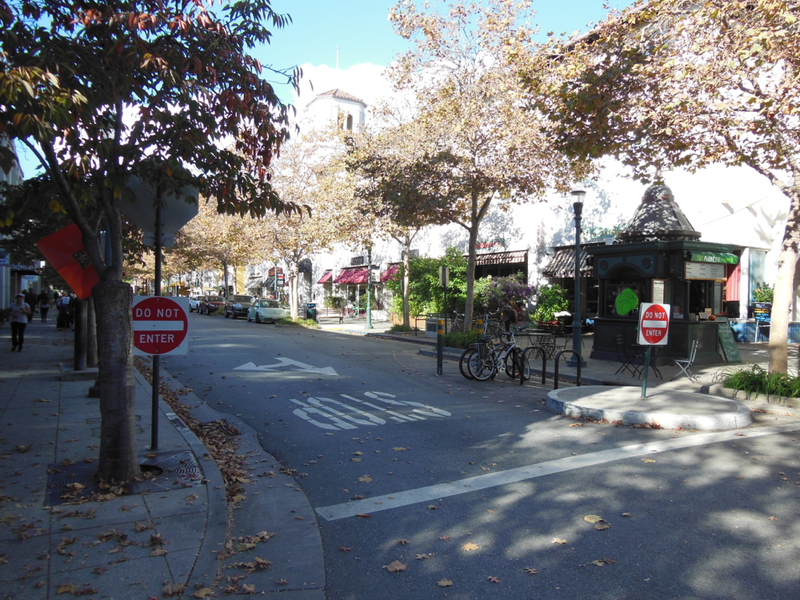 Wayfinding, map signs, bike route signs, and street marking (bike lanes, sharrows, white edge lines) would provide clear direction for cyclists and, at the same time, highlight to motorists of the presence of cyclists on the roads. Wayfinding and signage should ensure that cyclists knows where cyclists are geographically at any time, that cyclists are heading in their desired directions, that cyclists are aware of any conditions ahead that requires special attention, and that cyclists becomes aware of any special interest along routes. Cyclists should never be confused, hesitate, or uncertain as to where one should be cycling. Road signs should provide destination, direction, distance, travel time, information, and warnings in a timely manner. Wayfinding should be focused on potential cyclists especially those with high desire for risk aversion and limited propensity for cycling. Wayfinding should appeal and be understandable to young children. Wayfinding should also be supportive of seniors cycling, especially readable by senior cyclists with reducing eyesight. Wayfinding should be readable far enough away to make a decision and take corrective action. Wayfinding should be supportive of a country changing in cultural background with a large new landed immigrant status. Wayfinding should pass the test of supporting a significant growth in cycling traffic. A comprehensive set of road signage should heighten cyclists’ comfort on the road and encourage people to cycle as a means of transportation. Besides supporting growth of cycling, local businesses along a trail, their towns and their inhabitants will also benefit. Water tower at an electric power dam in the distance. It is all about aligning a trail to maximize the attraction to cyclists, including those who cycle today and those who can be induced to cycle, thus maximize the cycling traffic volumes. 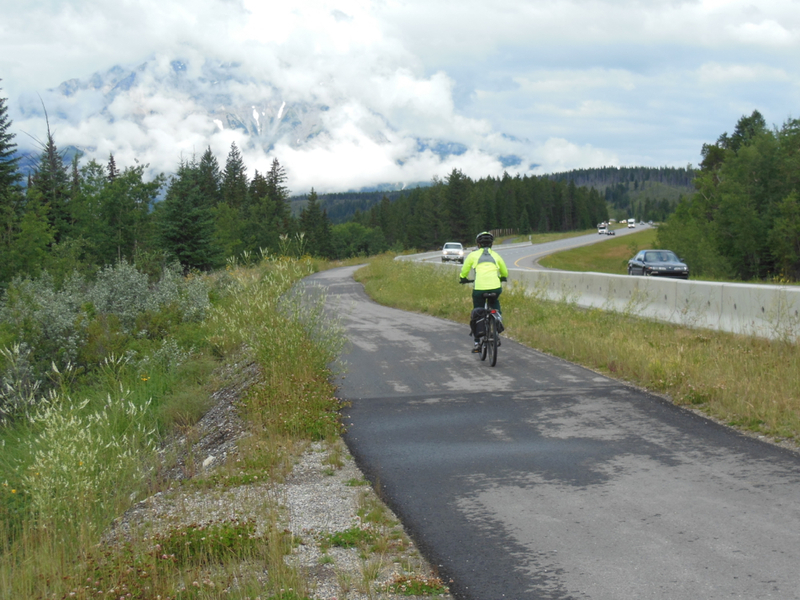 The market for this trail includes Banff to Canmore commuters, visitors to the park, and day-trippers from Calgary and other municipalities within a day driving distance. 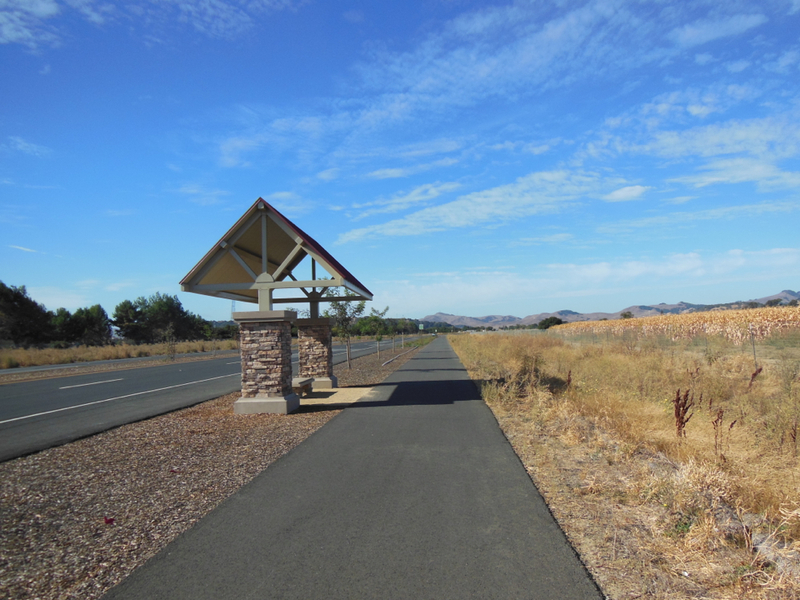 The Legacy Trail seems to be laid out sensitive to the topography and the terrain adjacent to the highway. Unlike the roadway where the terrain was changed to accommodate the highway, the trail is ribboned up and down the terrain, in between and round trees, and squeezed in between adjacent rivers and the road. From a cyclotouring perspective, the trail alignment provides a variety of experiences, including trains passing by. The trail alignment results in a variety of separations with distances from as little as a half metre to a distance where car traffic becomes a hum. Forms of separation come from simple techniques such as gravel or grass, vertical elevation, and physical barriers, such as concrete barriers. 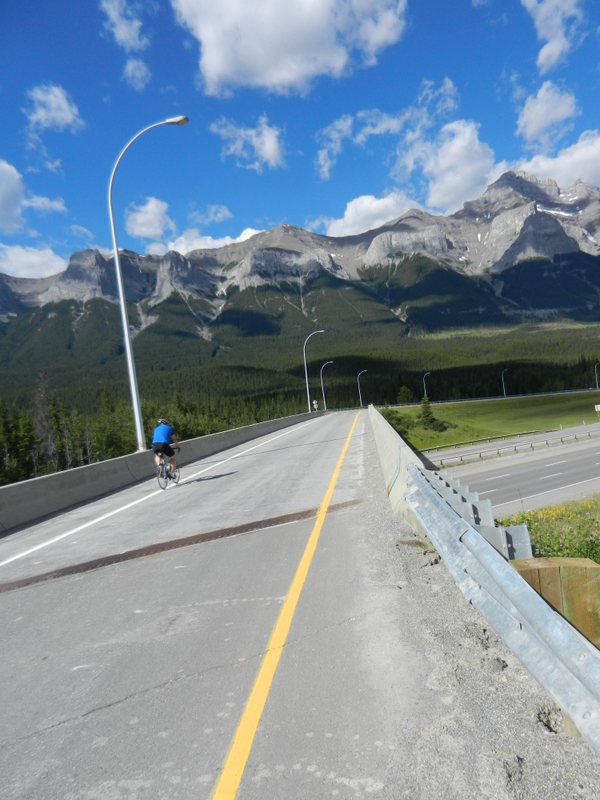 Over bridges, wind protection for cyclists is provided by high barriers. Images – Separation – horizontal, vertical, physical, virtual, distance from traffic lanes. Bridge providing wind break for cyclists. Two metres plus physical separation with concrete barriers. Narrow separation with physical barriers. A metre separation with a physical barrier. 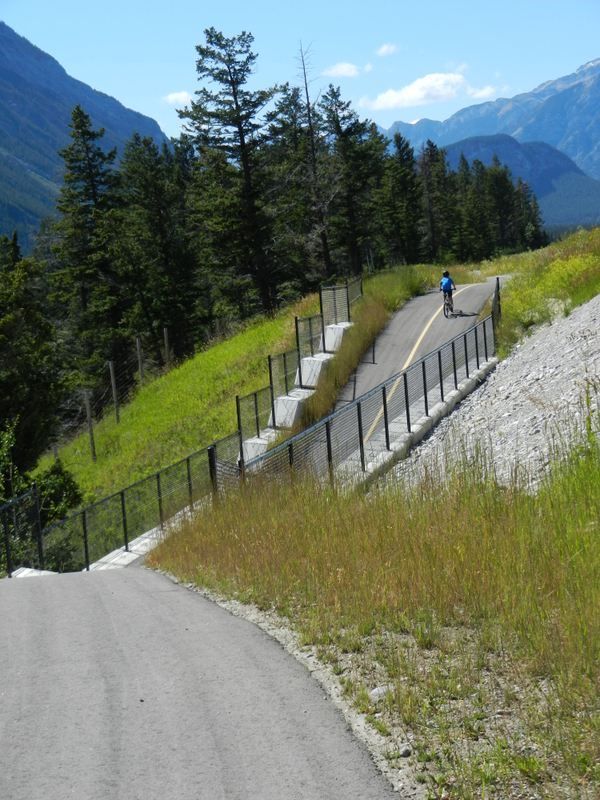 Of course, the forms of separation along the Banff Legacy Trail have appeal to potential users of this trail. Observing cycling traffic, it is very apparent that parents are quite willing to let young children, some just able to be on bicycles or tricycles, cycle freely in front of them. Trail design should focus on the impact that the trail will have in encouraging people to cycle between destination rather than driving, especially in parks designed to keep the lands natural. 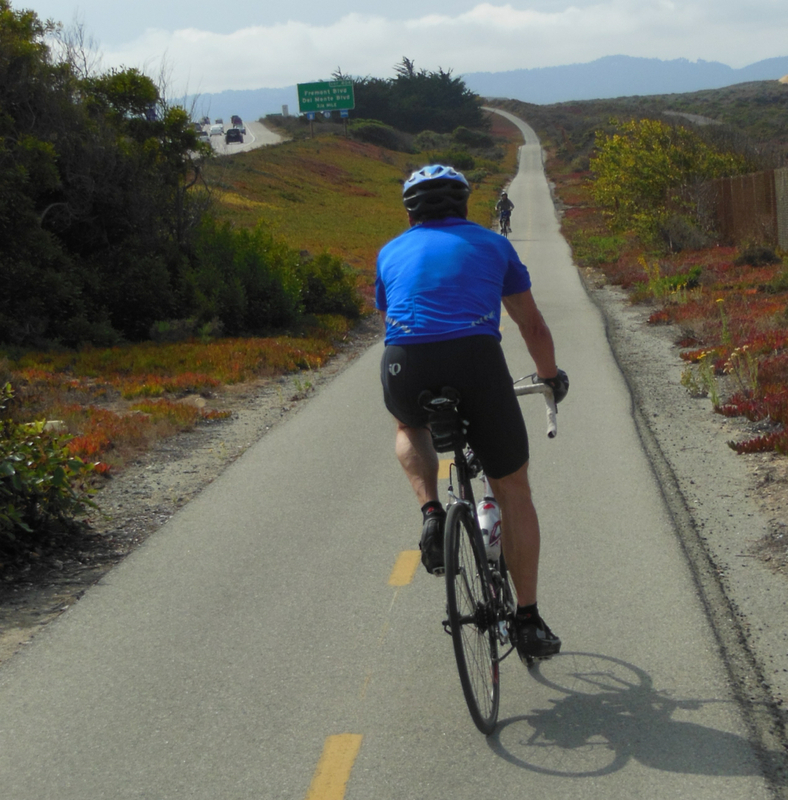 Alignment of trails need to consider air and noise pollution on cyclists, as well as, the effect of winds and drafts from vehicles on keeping cyclists comfortable and secure. More later on this. Time for a convenience stop. Time to relax and enjoy the mountains. The trail has a convenience stop approximately near the middle, which is much appreciated. What about at each end? Designing a trail for seniors should consider facilities about every half hour of cycling especially for the first hour and a half into a trip. Designing roads for cars and trucks, future volume projections are taken into consideration. The same methodology does not seem to be used by professionals when designing cycling facilities. 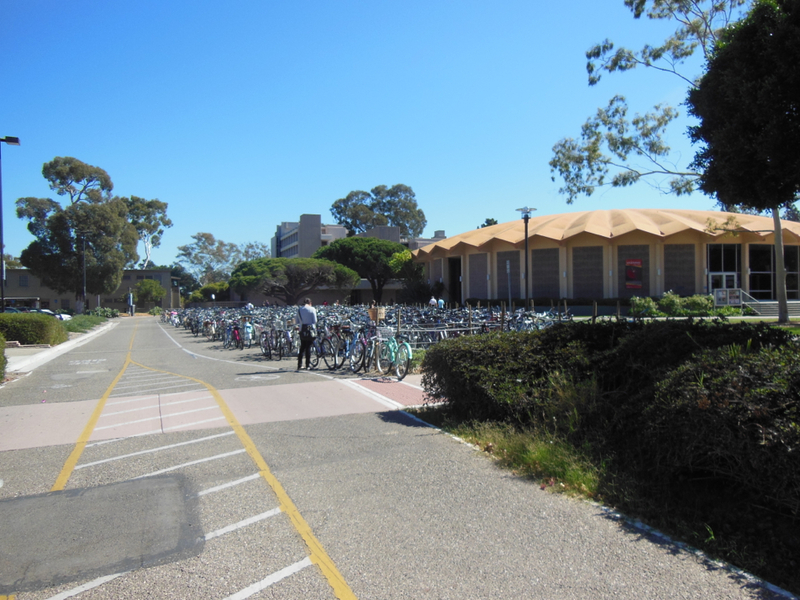 Even the width of this facility is not sufficient and running out of capacity after a year of operation, considering the needs of the cyclists using the trail and people walking. The thrill of a fast descent. What about icy days? Maybe a bridge bypass would attract the risk averts. For some, cycling up the steep incline is good exercise. For others, pushing a bike up is more the likely case. What about the young children on bicycles? What about parents pulling children trailers? An alternative on the embankment at a moderate grade would be appealing to many. Cyclists are sensitive to road grade, especially parts of the market made up of infrequent or potentially new cyclists and tourists wanting a local experience. Considering their body conditioning for cycling and hill climbing, this cycling market place is sensitive to the amount of energy required to cycle trails. 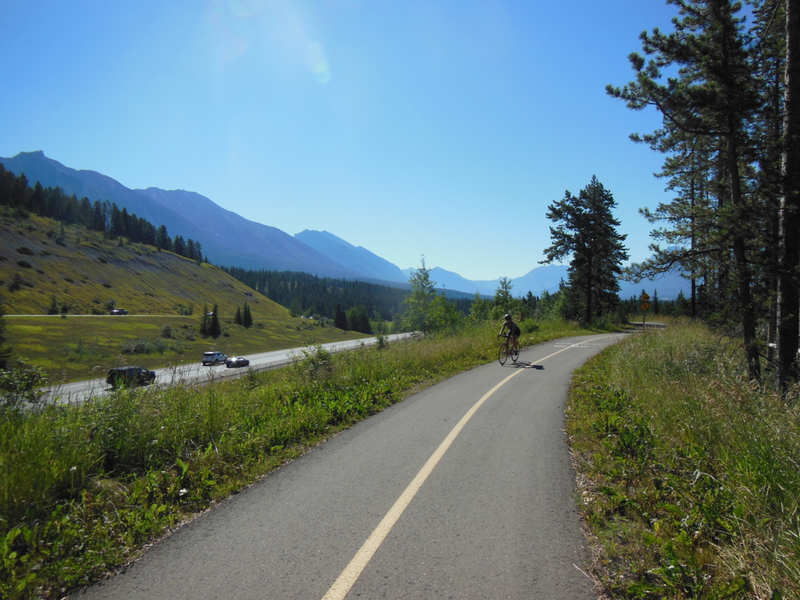 Both grade and pavement of a trail become important considerations. Experience with cycling growth in the Netherlands and the appeal of the Le Petit Train du Nord trail in Quebec would indicate the attractiveness of low grades peaking at 3% or 4%. 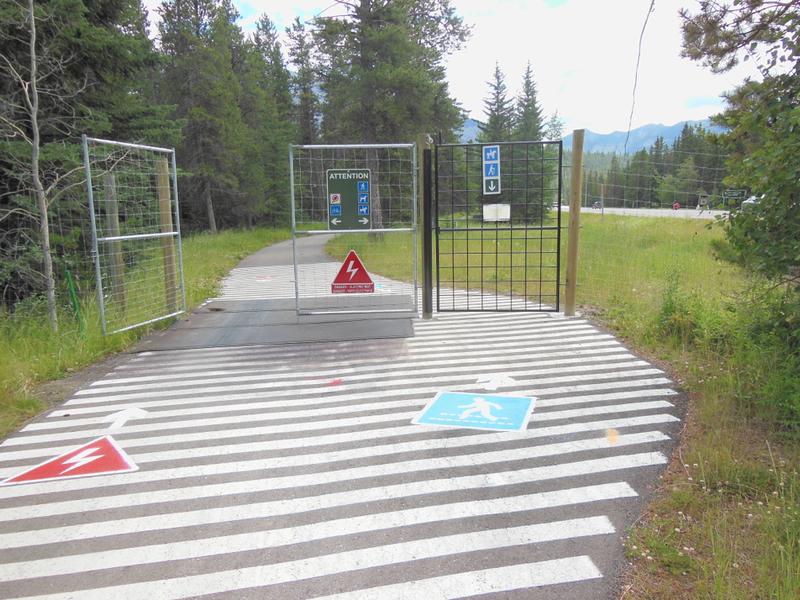 Considering that this trail is intended to appeal to families with small children, park users, and tourists, it is quite difficult to understand the trail alignment just after the Banff Park Gate at the Canmore end. Suddenly, the trail does an s-curve as it climbs at a 12% grade. Who expects children and infrequent cyclists to make this climb when more seasoned and conditioned cyclists get off their bikes and walk the last few metres? Instead, the trail should have been aliened at a 3% or 4% grade along the road embankment. Leave the steep climb alignment for those who want that type of experience and have a moderate graded trail option for 6-year-old children on bicycles or for parents pulling their children in trailers. This trail is surfaced by asphalt extending the season that the trail can be used. 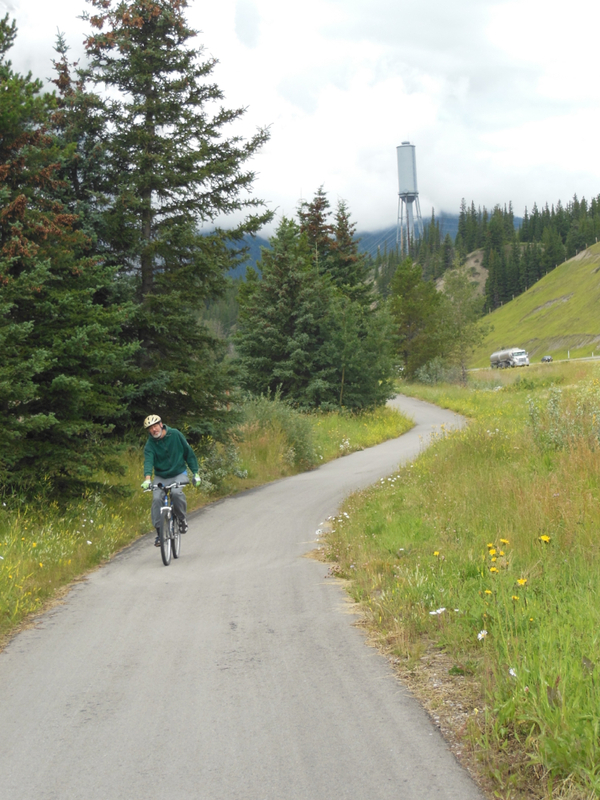 Water on gravel trails, both from rain and winter precipitation, will encourage people to stay on the neighbouring highway shoulders and discourage people who cycle less frequently from using the trail. Lessening the impact of motor vehicle pollution on cyclists – separation. 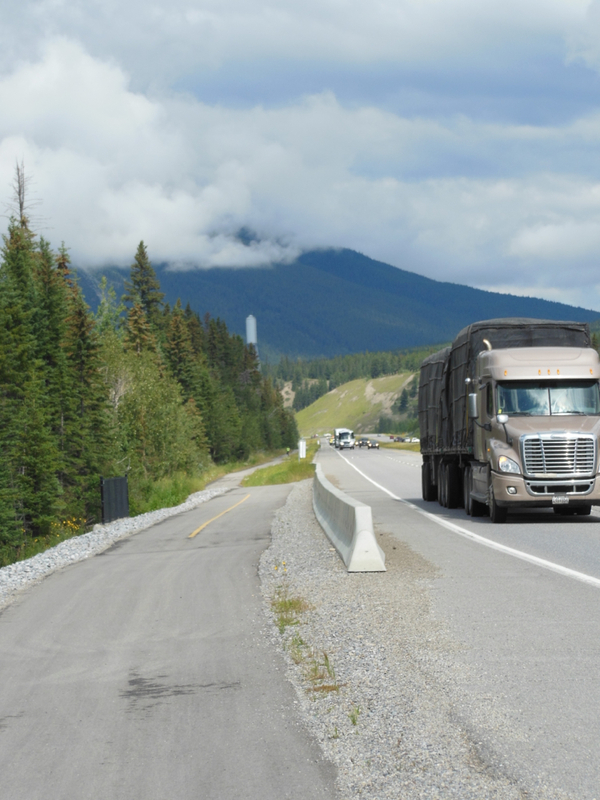 Cars and trucks pollution emissions dissipate with distance. In essence, there is a pollution envelope around these vehicles. The farther that cyclists are removed from the source of pollution, the less impact on them. Studies have been done to start defining these envelopes. More studies are needed before the envelopes are well enough defined for designing the alignment of cycling facilities, which minimize impact on cyclists. From the research that has been done, we know that bike paths two metres away from traffic lanes is better than one metre. Three and more metres are of course better than one or two. On a trip from Vancouver to Chicago with a colleague I became aware of the severe impact that noise pollution can have on people. Apparently, as one ages the effect becomes greater. While the noise pollution envelope is not well defined for alignment of cycling facilities, the greater the distance between traffic lanes and cyclists, the more appeal the facilities will have to draw cyclists. 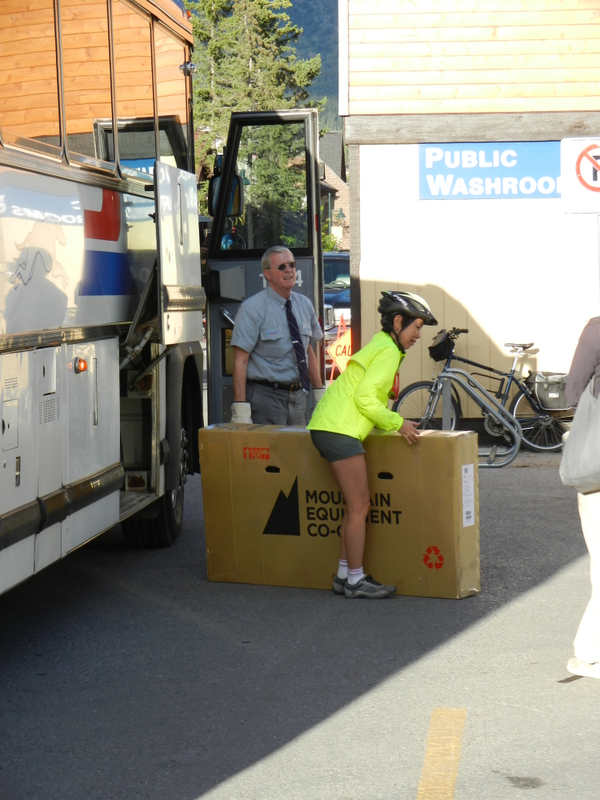 Getting caught in the draft of a fast moving truck or bus can be unnerving for less experienced cyclists and even the more risk-taking. 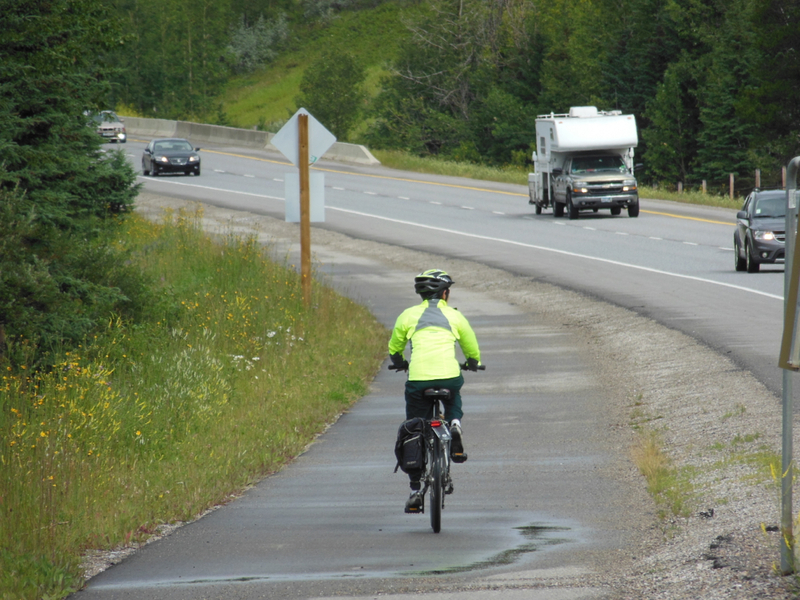 Nothing like having to steer a bicycle into the direction of buses or trucks to compensate for draft after these vehicles pass and strong crosswinds takes hold of cyclists going down a steep grade at fast speed or cycling on more level terrain. Quite a distractor for the uncommitted cyclists. Wind effects of moving vehicles including buses and large trucks has been researched and documented. 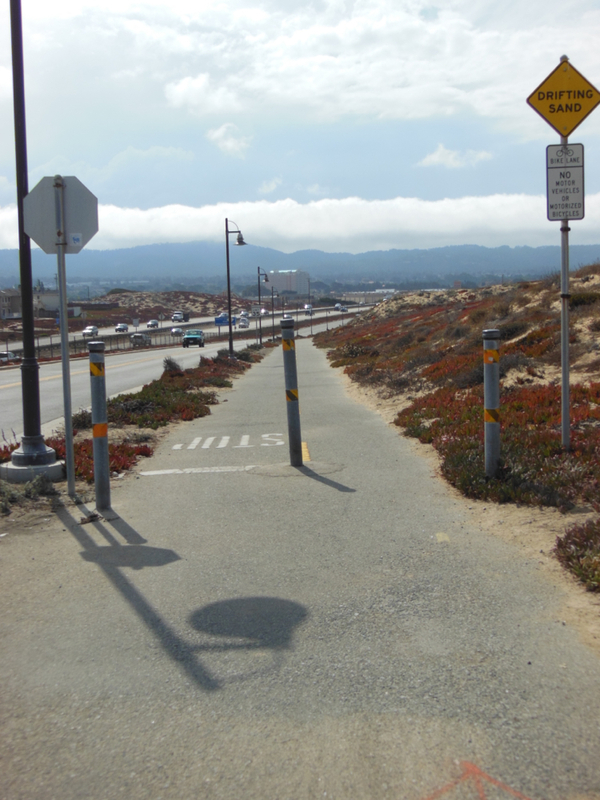 Location of cycling facilities, such as this trail, need to consider the wind envelopes under different wind situations, including crosswinds. For simple winds, a minimum separation of two metres should be provided. For crosswinds the separation should increase or double, at least. Keeping wildlife off the highway has been a preoccupation of this park for the last decade or two while still facilitating migration from one side of the highway to the other. 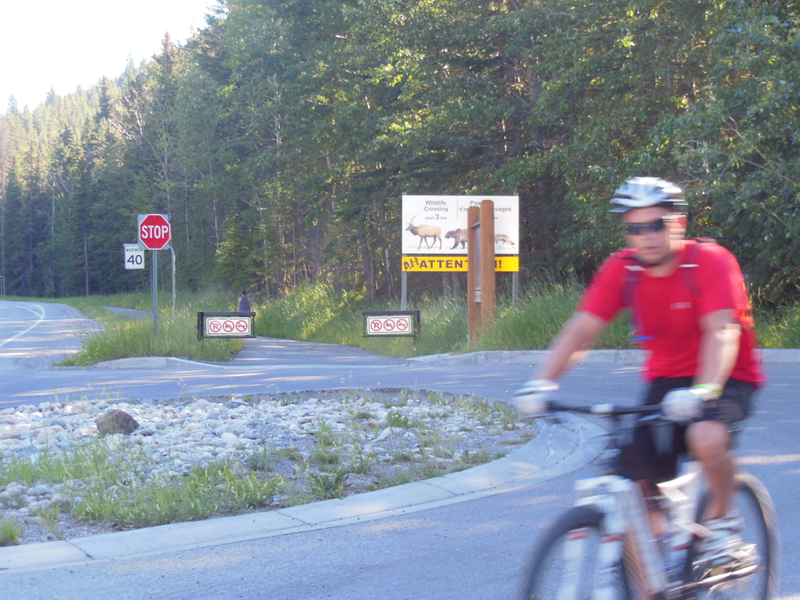 So, with this trail Canada Parks had to come up with a scheme to keep wildlife off the trail while still allowing easy passage of cyclists and walkers. For this purpose, electrical gates were installed at two locations. Walkers’ passage is through gates that they open manually. Cyclists are greeted with signs indicating that they should not stop on electrical pads lying on the asphalt surface at gates that are kept open for their passage. The system seems to work well as cyclists just need to slow down through the gates. At the Lake Minnewanka cutoff, the locations of the gates are in a dip that affects two-way flow. Gates at the top of the dip would have been more efficient from a cycling perspective. The rational for their current location is not known. This blog will be presented in five parts and released a week apart starting with 2012-08-09. 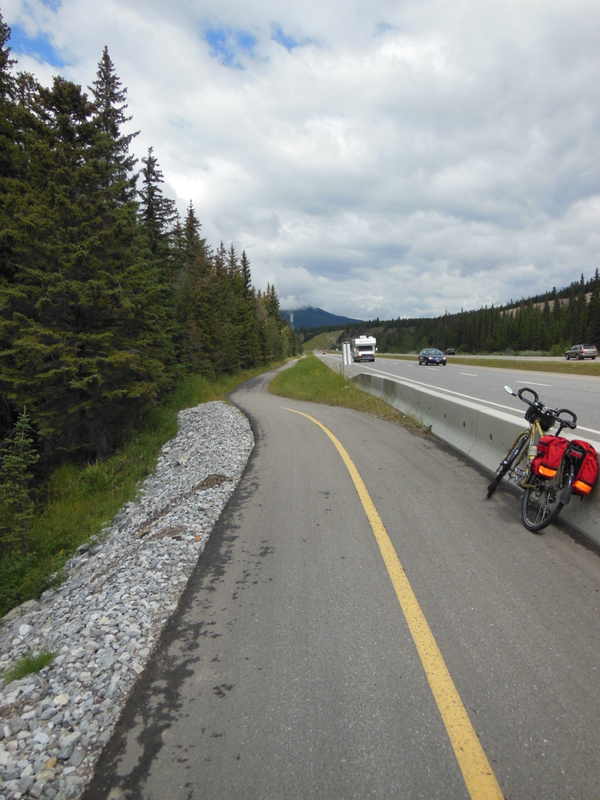 The next blog will give an afterthought on the attraction of bike paths (on rural highways) and on bike trails, rather than bike lanes or wide shoulders for cycling on highways.